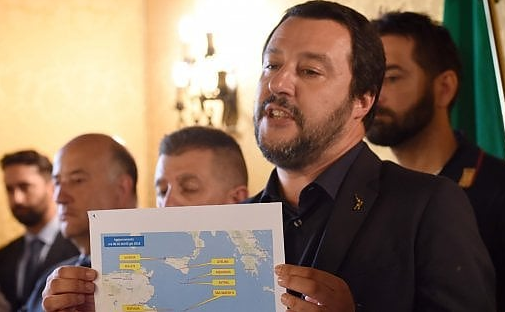 Mr Matteo Salvini, the new Italian interior minister and the leader of the anti-immigration party Lega Nord, refused entry to a rescue vessel carrying 629 migrants which wanted to dock in Sicily. At a hastily called press conference, he told reporters that it was no longer Italy’s sole responsibility to take care of the refugees fleeing from Africa. The German charity SOS Méditerranée picked up the migrants in Libyan waters, which technically mean they fall under Italy's jurisdiction under current EU legislation. The ship, called the Aquarius, had no choice but to return to open water after it was refused entry to port. Mr Salvini’s League had promised voters during the recent general election, which he won together with the anti-euro Five-Star-Movement, that if he was in power he would take a very tough stance on immigration, and Europe today is noticing what that means. Upon his order, the Italian Maritime Rescue Coordination Centre told the Aquarius to remain in its current position, 35 nautical miles from Italy and 27 nautical miles from Malta. It is clear Mr Salvini is trying to push Europe to notice his stance, and to do, what he considers, their fair share. France and Malta have not yet reacted. It's time we stop the invasion by illegal aliens. These are NOT immigrants and are not following the laws made and followed by legal immigrants. They are not respecting the laws of countries they are literally invading. Good job Salvini, runn’em off and under. They’ll stop coming. They all appear to be conscript age men, insurgents morelike than refugees. Cheers Italy! Good! Finally people are waking up to deliberate destabilization.